Superflat is a postmodern art movement, founded by the artist Takashi Murakami, which is influenced by manga and anime. In a response to the homogenization of Japanese media and art, “Superflat” attempts to critique the vacuity of post-war Japanese culture, including criticisms of the otaku lifestyle, consumerism, and related issues. 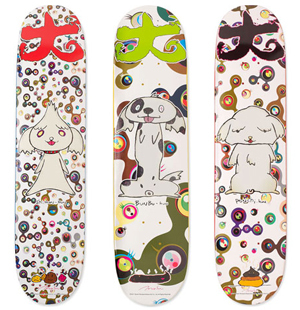 Currently the online store is closed but hopefully soon to be back as each deck is only $68 which makes this some of the cheapest Murakami art to own, considering his usual items such as Louis Vuitton bags go for $1k+ and posters range somewhere between $300 to $2.5k if signed. Just in case you haven’t seen it on T.V. or the intertubes yet, this will probably be a new fade on YTMND.